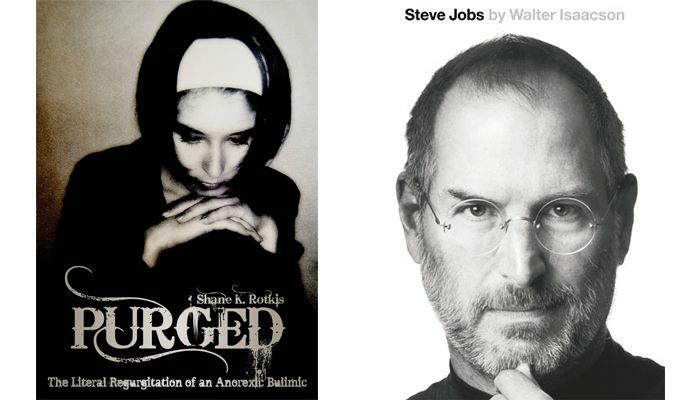 September and October were pretty nonfiction heavy, what with reading my beautiful cousin's anorexia memoir and with Ryan and I listening to the audiobook version of the biography of Steve Jobs. September and October were also over a month ago... something I only realized today when I was trying to remember if I did my reading wrap-up from the fall (Spoiler alert: I didn't). I did however break into the double digits for books read, which sadly, is better than I did in 2011 and 2012 combined. Now that I have my iPad and am furiously trying to finish up a final couple of books on my Kindle app, I think that I will finish out the year with a decent number of books under my belt, but no where near my #50Books goal for the year. There's always 2014! Purged by Shane K. Rotkis - Throughout my preteen and teenage years, I had no need to be concerned about weight. After all, I hovered around 100 lbs. Yet I was very worried that all my friends were on "diets" and I wasn't. I remember thinking that they knew something that I didn't... that we were all going to suddenly gain 20 lbs soon or that I should be skinnier. I struggled on and off with how I was supposed to feel about my size, but thankfully, I never developed anything close to resembling an eating disorder. My friends, however, did. And after reading my cousin Shane's memoir, "Purged" about her own struggles with anorexia and bulimia, I could see how easily things could have been very different for me. I read "Purged" as both a family member and as a woman who has seen several loved ones affected by various eating disorders and self-esteem issues. As a family member, I was stunned by how many thought impulses and viewpoints Shane and I have in common, despite the distance between us growing up (both in time and in age). Her courage to be transparent about her life reminded me that it's important to be transparent about my own - you never know who you'll connect with that way. As a woman, this book was eye-opening in so many ways to the brutal nature of these diseases. Shane captures them viscerally and it is a must-read for parents, friends and family of those who are currently battling anorexia or bulimia. Steve Jobs by Walter Isaacson - I have to say, this biography has been as inspiring as it has at times been surprising. I worked for Apple Retail for a while when Jobs was alive and it was his sister Mona Simpson's novel "Anywhere But Here" that first showed me the freedom and power to be found in storytelling. In these seemingly little ways, my life has been affected by him far past the larger impact he had on society through the innovations he led in technology, music, and design. That connection, however small, is what encouraged me to start this 630 page / 25 hour undertaking in the first place. But it was worth it. This biography was great and chock full of perspectives and anecdotes that I absolutely loved. I also think it's a great read for anyone pursuing a dream - whether they are an entrepreneur or artist, his story has something to inspire everyone. The book really helps to illustrate Jobs's flaws and failings in a way that shows how they led to his successes and the lessons there alone make it worth reading. But the journey through contemporary history and the detailed insight into the life of a modern da Vinci is just as enjoyable on its own accord.